July 28th marked the centenary of the beginning of the First World War, and I thought it would be a good thing to call attention to some book that would mark the occasion. As luck would have it, I came across the perfect book to exemplify the beginning of this conflagration, which everyone at the time thought would be over by Christmas, and instead lasted for four years. 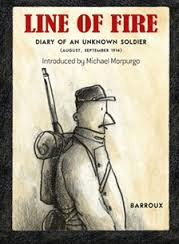 The subsequent graphic novel Barroux made of this simple narrative took two more years for him to research so that he could provide a meticulous and haunting visual accompaniment to the story a simple soldier tells of the first days of the war. As Barroux, says, part of the appeal of this man’s story is that it is his own story, “uncensored by the military, government or history textbooks”. It is perhaps what he doesn’t know as he sets off on that first August day of mobilization that makes his story so poignant. Michael Morpurgo, who wrote the children’s story that was turned into the acclaimed musical Warhorse, which uses horses to depict the universal suffering of war, says in the introduction that even after studying this war, it was only when he met someone who had been there that he really began to understand “the horrors and terrors, the camaraderie, the humour, the sadness and the suffering”. Because of Barroux’s retrieval of this nearly lost testament, we too can have something of this experience. I am hoping to dip into some of the great trove of writing that has come from and about this war as time goes on, but in the meantime I will link below to a list of books compiled by Adrian McKinty, an author whose judgement I respect, because it’s never a good idea to wait on me.